On Wednesday 29 August @ 10am The Lord Mayor of Adelaide Martin Haese along with Minster for Transport HON Stephan Knoll officially opened the bikeway counter on the corner of Pirie and Frome Streets displaying daily, monthly and year-to-date bike rider counts. ”With high-quality landscaping, Frome Street now looks and performs better while keeping bike riders safe. Thank you to all of my fellow Elected Members who unanimously supported these improvements. Thank you to the State Government and Minister Stephan Knoll MP for the partnership. Thank you also to Bicycle SA, the Bicycle Institute of South Australia and all stakeholders for making this project a work-in-progress success” said Lord Mayor Martin Haese at today’s opening. To view Lord Mayor Martin Haese opening the start of the launch event watch the BIKE SA facebook live stream. Some images from the opening. 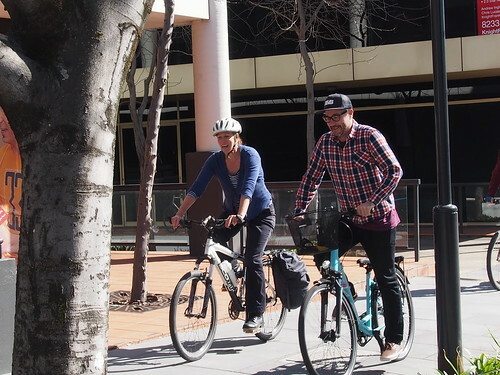 For more information ábout the Frome Street City Bike Ways Project visit. What a spin! Try riding from Rundle Street to the Zoo footbridge! It is a nightmare!